One of my favorite parts of using a Chromebook is the ease of setting up secondary displays. I’ve yet to encounter a display that didn’t just work when attached to my Chromebook. Even with differences in scaling and DPI, moving windows between screens is fluid, easy, and the setup is painless. For me, using the screen on my Chromebook and my second, additional screen is enough to handle my daily workflow. I’ll keep secondary things like notes, music and messengers on my Chromebook screen while my main work windows stay on the larger, extended display. I’ve toyed around with adding another display to this setup and had some success, but if you’ve ever tried to do this, you know the headaches involved. Finding a USB-C splitter that actually splits your display output into 2 extended displays is tough (for what it is worth, MacOS struggles with this as well). They mostly tend to give you two mirrored displays instead. The only workaround I’ve found is leveraging DisplayLink over USB 3.0, but that requires another adapter and is a little hit-or-miss when compared to the solid connectivity of standard USB-C connections. Sure, Chromeboxes have dual video outputs, but they don’t have an internal display. If you split either of those two included outputs, you run into the same mirrored screen issue. We know there are some options coming to market pretty soon that will address all of this and allow multiple screens to connect to a single Chromebook, but there’s an even more elegant solution that already exists and would be a really great add to Chrome OS. Daisy-chaining displays is not a new or novel idea. Lots of monitors actually support this already, but Chrome OS currently does not. The idea is, instead of every monitor having to hook into the main device, monitors can attach one to another and pass all those signals to the main device via a single connection. 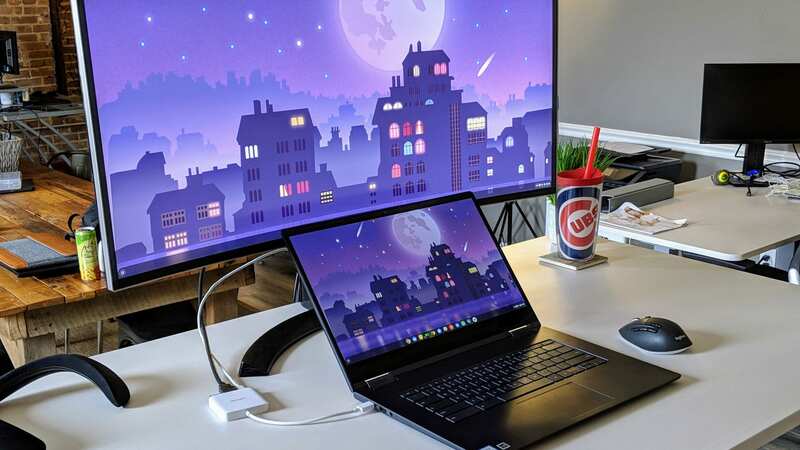 In this way, if you had a Chromebook and two external monitors, you could connect one cable to the first monitor and that monitor could connect to the second monitor without need of a physical connection back to the Chromebook. As you add more monitors to the mix, the ability of daisy-chaining to clean up your setup is quite clear. The MST chip for Hatch needs to be enabled when HPD signal from either the Port 1 TCPC or HDMI port is high. This CL adds support to enable the MST chip based on this criteria. For the Port 1 type C port, the HPD signal level is derived from the USB PD policy level where the HPD update driver method is called. TEST=Used external HP Z27n monitor and verifed the display is extended as expected when it’s connected to either port 1 type C port or the HDMI connector. It is hard to tell at this point whether or not this will end up on older Chromebooks or if this will be a feature that only newer devices will come with. It seems that there is clearly a chip being enabled here, but it isn’t clear whether or not that same hardware is currently present in Chromebooks currently on the market. The main requirement we can find regarding MST is DisplayPort 1.2, and it seems a great deal of Chromebooks with USB-C display-out ports support this spec, so it would follow that this feature will trickle down to devices with USB-C ports. If your Chromebook has only HDMI outputs, don’t count on seeing this feature now or in the future. We’ll be keeping an eye out for further development on this.